The Jesuits have been working in Galway since the early 1600s. Even before then, men from the west of Ireland had been joining the order. It was the policy of the order at the time that only priests with a fluency in the Irish language would be sent to work in their native areas. The first Jesuit college in Galway was set up in 1645 and was located where Powell’s, The Four Corners, is today. The language of the classroom was Latin, but Irish, as the language of the people, held a special place. The college was founded against a background of wars and dissensions, but somehow, it flourished. However when Galway surrendered to Cromwell, Catholic life virtually came to an end in the city and all priests were banished. Some of them managed to come back around 1660 but little or no progress in the field of education was made in the following years. During the Williamite Wars of 1688- 91, all members of the Jesuit Community again left Galway but they returned in 1727. Due to a lack of manpower, the Galway residence was closed in 1768. They returned yet again (this time for good ) in 1859 and were based in Prospect Hill and later Eyre Square before moving to the newly constructed school and residence on Sea Road in 1862. The following year the Church of St Ignatius was dedicated. Attendances at Mass and ceremonies grew rapidly with devotions and confessions often going on until midnight. The college was more of a challenge. Numbers were small at first but academic standards were high. Some ground at the rear of the school was purchased in the early 1900s and provided adequate ground for a much needed playing pitch. Numbers were growing, as was the competition from St Joseph’s College and now St Mary’s College. The total number of boys in the city available for secondary education was estimated at 270 students, and because of this and a stressful financial situation, it was decided to close the Jes in 1926. This was not a popular decision and a period of intense lobbying began which resulted in the college re-opening in 1929. Since then it has evolved into the institution it is today. 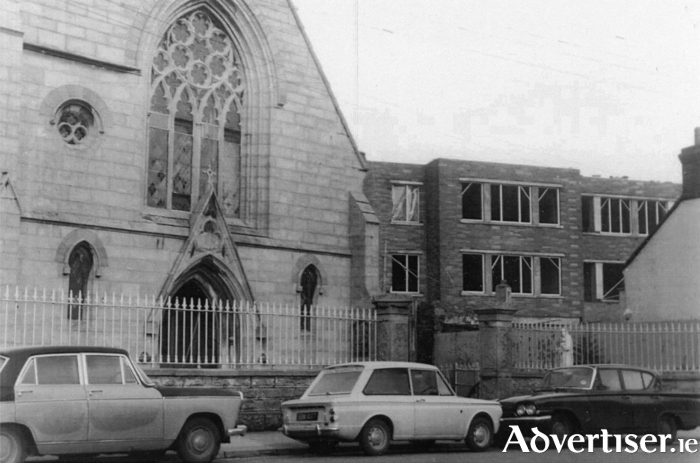 It became Coláiste Iognáid where all the subjects were taught through Irish, it became co-educational, established a dedicated bunscoil, introduced classes through English, added new subjects to the curriculum, and greatly expanded extra-curricular activities. Our 1968 photograph shows one of the major changes, the building of a new school to be named the Griffin Building in honour of a long serving charismatic teacher, Danny Griffin. Since then, a new state-of-theart building has been constructed and was formally opened last year by President Michael D Higgins. The college is organising an Inaugural Jes Gathering in The Ardilaun on Friday May 1, a fundraising dinner dance with lots of fun and entertainment, so if you would like to meet up with some of your old school buddies, why not book your tickets by calling Jacinta O’Gorman at 086 103 1420 , Siobhán Casey at 083 102 9020, or email [email protected]. All of the above information is taken from an essay by Paddy Lydon in a beautifully illustrated book entitled The Jes, 150 Years of the Jesuits in Galway 18162-2012, which is highly recommended and available at the school and in good bookshops at €30.